Hi everyone! As of this writing I am probably in the middle of voting for the next Philippine leaders. This is my first time to vote and I honestly have mixed emotions. Are you a first-time voter too? Anyhow, I have a blog update, new posting schedule and quick announcement to make. Sounds great, yes?! SavingsPinay has been active since 2013 and with over 350++ posts and counting I know how hard it is to keep track on everything. And so I encourage you to use the main pages of SavingsPinay that includes New in SavingsPinay, Personal and Financial Goals 2016, Archive of All Articles, Link to SavingsPinay Facebook Group and a Contact Me page. 1. New in SavingsPinay shows a dedicated page touring you on how to get started with the blog. You can get a copy of my First eBook and links to different SavingsPinay Series. 2. Personal and Financial Goals 2016 is post I published last year where I share my big goals for the year. Click the link to know my great plan to succeed and to stick to my goals. 3. Read All Articles is an archive of all posts published in SavingsPinay alphabetically arranged under categories. For easy searching click CTRL+F and type any keyword. 4. Join SavingsPinay Facebook Group. The SavingsPinay Facebook Group is available to find others who like you, is committed to experience financial freedom one step at a time. Act now. Make your move and let other know. You can go to the page and share if ever you did any of the above money moves for January. You can also update everyone of your financial move or share anything that involves financial wellness. 5. Contact Page. I am opening SavingsPinay for ads, sponsored post opportunities and other way I can use the blog for the betterment of everyone. This contact page is also available if you want to learn how to contact me then click this link. You will see the SavingsPinay Pages on the side bar of this blog and at the footer. Maintaining two blogs can be a daunting task especially for someone like me who happen to have a full time job. I also have a YouTube Channel which I wish to give more love in the coming months. And so though I try my hardest to blog everyday for SavingsPinay, I can't. And so you can see I fail every single time to keep up with that posting schedule. 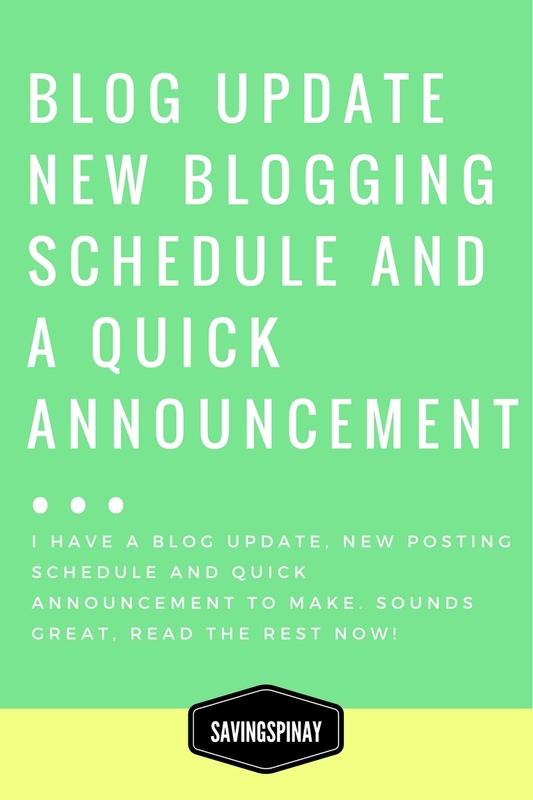 And so to maintain consistency and blogging peace I decided to have a Posting Schedule Update. There will be New Blog Posts every Monday, Wednesday, Friday and Saturday. Monday will be a personal blog post, Wednesday and Friday will be Personal Finance Lesson (Budget, Savings, Investment, Entrepreneurship, Career, Productivity etc,) and Saturday will be a Weekly Notes where I give you the best and the latest blog posts and new involving money matters. I will still do a Monthly Quick Recap at the end of the month. I am currently in the process of making up with my SavingsPinay Money Makeover Newsletter. I am so sorry for being a major fail in this good endeavor. For those who have subscribed to the SavingsPinay Mailing List then please expect a Newsletter on May 21, Saturday (Add on your calendar). The Newsletter will include of course a letter from yours truly and a downloadable PDF versions of SavingsPinay Money Makeover February, March and April. You can learn more about this program HERE. I can't thank you enough for sticking to SavingsPinay. You surprise me every single day. I hope you'll continue your support and become part of the SavingsPinay community via comment section below or through SavingsPinay Facebook Group. Just click JOIN!! !